Harry Potter and the Half-Blood Prince had a difficult task set for it, as J.K. Rowling’s sixth entry into the world of Hogwarts is the most accomplished of the first six novels. The plot moves rapidly and is coherent and engaging in a way rarely before present in the series. Fortunately, director David Yates was asked to return after helming one of the better films in the series, Harry Potter and the Order of the Phoenix [review here]. Old enemies become more dangerous as Harry’s counterpart, the sneering Draco Malfoy (Tom Felton), joins forces with the Dark Lord in unforeseen ways. Professor Snape (Alan Rickman), whose fealty is always difficult to predict, continues to tread the line between the good guys and the bad guys until the end makes everything transparent. New characters are added, primarily the odd Professor Slughorn (Jim Broadbent). His specialty is becoming friends with high-performing young wizards, hoping that they will not forget him once they are successful adults. Other, smaller characters have a chance to enjoy extended screentime, particularly the incredibly pale (but surprisingly attractive) Bellatrix Lestrange (Helena Bonham Carter). Her role as a chaotic evil witch is nicely over-the-top, with Carter relishing the chance to wreak havoc. Ginny Weasley (Bonnie Wright) also gets more attention as Harry’s budding love interest. The problems with Harry Potter and the Half-Blood Prince can be mostly blamed on the screenplay. When the source material is heavy with plot it becomes difficult to pare it down to the essentials. The first half of the film does this admirably, with extraneous scenes judiciously excised and shortcuts effectively taken to provide the audience with the basic plot points without taking too much time. The film moves along nicely, blending intimate scenes concerning Harry and his friends and their love lives with a sense that a grand, epic finale is not too distant. The second half falters. A scene is added involving the Weasley’s house, but it does not appear to add anything to the story other than pyrotechnics. Perhaps they are setting up elements for the final film. The finale is also rather lackluster. The epic showdown is shortened and less impressive than it ought to have been, though it is by no means bad. More of the source material could have been used to bolster the ending. But there are plenty of reasons to enjoy Harry Potter and the Half-Blood Prince, many of them revolving around the film’s production. Yates’ visual flair is helpful in creating an atmosphere of foreboding. I wish I could have seen it on the big screen (perhaps I will have the chance when the last two entries are released and marathon sessions are screened at theaters) as there is so much detail packed into each scene that it feels like a visual feast. Yates favors long shots designed for a very large viewing service, and takes the time to make every scene look like an ornate replica of Hogwarts’ interior. Magical objects and creatures buzz about, but many of them remain at such a distance it is hard to discern them on a home theater setup. 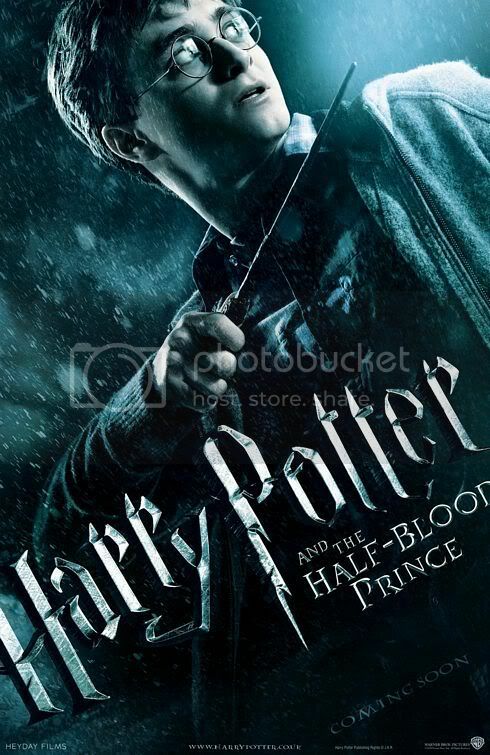 Harry Potter and the Half-Blood Prince is enjoyable and entertaining. It briefly touches the surface of the interesting plot points without delving too deeply into any of them. The visual aesthetic combines with some stylish directing and accomplished acting to tell the story effectively, though hardly concisely at two and a half hours. Devotees of the novels might have trouble swallowing some of the adaptation’s alterations, but as a pared down, filmed version of the book it does an enjoyable and serviceable job. This entry was posted in 3 pirate flags, 3 stars, H, Movie Reviews, Pirate Flag Rating, Star Rating on March 14, 2010 by Tim Irwin.